Republicans are growing closer to consensus on plans for Congressional redistricting and the map that they’re describing sounds very similar to that published last week by the Cook Political Report. PoliticsPA spoke with several Congressional sources as well as outside consultants to determine the broad strokes of the GOP’s plan. They say David Wasserman, who composed the Cook preview, has good sources and his analysis is the closest yet “to reality.” The complete report is behind a paywall, but you can view the full sized Cook map of PA here, and the SEPA map here. Now that the census data is out, discussions will begin in earnest. DC Republicans are maintaining strong, open lines of communication with leaders in Harrisburg, and sources indicate that the relationship has been productive so far. Here are some of the redistricting ideas that are generating growing consensus among the GOP. The most striking feature of Republicans’ tentative plans is the change to Tim Holden’s 17th Congressional district. Currently, the 17th covers all of Holden’s home county of Schuylkill County, as well as Dauphin and Lebanon. The district comprises parts of Perry and Berks counties as well. Republicans are talking about stretching his district up to the Democratic stronghold of Scranton, so as to make freshman Rep. Lou Barletta’s district far more favorable to the GOP. This idea has really caught on in the past two weeks, and appears more likely every day. In addition to taking Scranton out of Lou Barletta’s district, the Holden plan has the benefit of taking the Congressman out of Republican portions of Lebanon, Berks, and Dauphin counties. This reflects a lesson learned by the GOP, who tried to draw Holden out of his district ten years ago, only to have the senior Republican in the delegation, George Gekas, lose to the scrappy Democrat in the ensuing campaign. Tom Marino’s 10th distrct would move west, toward the center of the state and into more Republican-friendly territory. The seat targeted for dissolution would be that of Rep. Mark Crtiz. The GOP is looking at ways to attach Critz’s Democratic base in Johnstown to the district of Rep. Jason Altmire, whose district would itself lose Democrats to the Pittsburgh-based district of Rep. Mike Doyle. That would set up a Democratic primary between Altmire and Critz. Republicans emphasize that they’ll be conservative this time. They’ll be drawing out a Democratic seat for sure, but they won’t attempt to make every Democratic seat more competitive as they did in 2001. They are trying to protect their gains of 2010. The main question, how competitive will the GOP the merged Altmire/Critz district, will likely fall to Rep. Bill Shuster. If he is willing to take traditionally Democratic counties of Fayette and Green, the the new seat will be much more achievable for Republicans. If however Shuster wants to maintain his lopsided party registration advantage, Republicans may cede the Altmire/Critz district to Democrats. So far, sources indicate that Shuster is cool to the idea of bringing more Democrats into his district. He argues that the delegation needs a few solidly red seats in order to help other members of the delegation with fundraising and other political affairs. 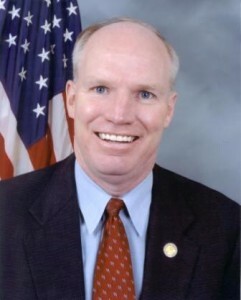 In addition to Shuster, Rep. Mike Kelly will have the chance to make the Altmire/Critz district more competitive. The more Lawrence County voters he takes on, the more of a tossup the new district becomes. Additionally, it’s expected that Kelly will acquire the southern half of Butler County (his home county, political base, and a heavily Republican area). Republicans acknowledge that no scenario allows them to totally protect their delegation in southeast PA, which had trended steadily Democratic prior to 2010. Democrats see that, too. They’re looking at historical election patterns and taking heart, despite the fact that Republicans control the process. More than any other state in the nation, PA has GOP congressman who represent districts won by Barack Obama in 2008 and John Kerry in 2004. SEPA especially gives them hope. Representing the people is a long lost concept; all of the redistricting plots will not save America from it’s course of destruction.It’s common knowledge both parties have been corrupted by Wall Street’s purchase of Administrations and congress. Until all of those psuedo concerned politicians give up their bags of money from corporate America, and suddenly develop a conscience, we thee people are doomed to lose.”Government by the people and for the people” is a mere inconvenient constitutional distraction. The redistricting Santa Claus places the gift of election security under the tree of those whose electibility is weak. Whats new! I see that Greene County is in the 9th district to be served by Bill Shuster in this map. Being based in Altoona, hes even farther away than Mark Critz is now in Johnstown. Greene to me seems like a natural fit in Tim Murphy’s 18th district. It might have substantially more Democrats than Republicans, but it would be DINO and perform in the GOP column. Its not like Murphy has had any close shaves. Glad to see southwestern Mercer County put back together. Splitting it up was an injustice, plain and simple. I’m no fan of Mike Kelly, and I realize he’ll play stronger in the area because he’s from Butler County, but at least PA-03 will hold together better. PA-04, on the other hand, is a joke. As Carol says above: we need to quit playing games and make our districts more reasonable. PA-11 and PA-17 are also outlandish. On the whole, this map is a bit better than the last map the Republicans rammed through, back in 2001 (which the Supreme Court rightly condemned, but mysteriously let stand,) but we still have a long way to go before we get Pennsylvania right, apparently. Giving Allyson Schwartz any part of Philly is a HUGE mistake. Let Bradu and Fattah divide the city evenly. Then let Schwarts have the most liberal wards of Delco, Montco and Bucks and make her seat safe as well. Then Meehan, Gerlach and Fitzpatrick can divide the rest. It would be utterly stupid to still have Fitzpatrick hold onto Northeast Philly and the ultra liberal wards of Abington for instance. Amen to that, Carol. Although Holden gets a safer district with areas that neighbouring GOP Congressmen dont want, it extends 140 miles from Harrisburg to the northern border of Lackawanna. We demanded reapportionment reform and they predictably wouldn’t listen. At least this time there is some transparency and some opportunity for public input BEFORE the fact. Lets learn the new rules of the new game and play them for the public interest. Our Founding Fathers wanted our Congressman to be accessible “to the people”. If I live in Western Greene County, and have to go to Johnstown to see my congressman, that is not very accessible. Quit playing games. Make a grid and let the People be closer to the representative to hold him/her accountable. The GOP needs to help Fitzpatrick more than this map does. Keeping Fitzpatrick in Philly is just plain dumb. Look for Fitz to get rid of Philly and Lower Bucks, and pick up GOP areas of Montco that border Bucks. 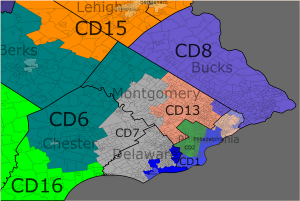 Who gets the short end of the stick this time—Dauphin County, which is split into three. Its voters and those of Lackawanna need to speak up. All and all, its much better than the current map. The counties which bore the brunt in 2001, Berks and Montgomery, fare better in this map. My district, the 15th, also improves. Pitts’ home is close to border with the State of Delaware and remains in the 16th. Student- look at the map!! East Marlborough is Pitt’s home, and it is now in Gerlachs district, not the 16th. It did not gerrymander, Joe Pitts out of his district….it gerrymandered nobody out of their district. It took condenses the 12th and 4th District making a primary challenge for Altmire and Critz. 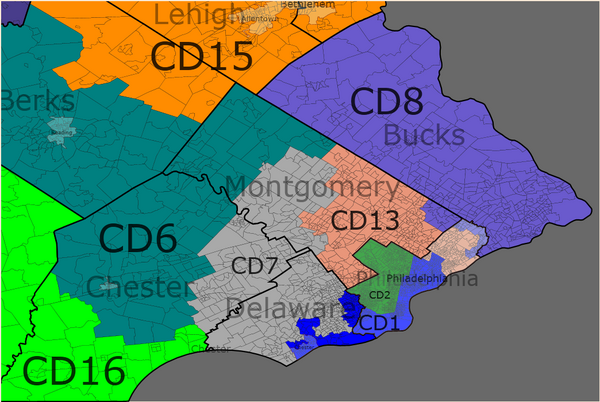 I like how Charlie Cook gerrymandered Joe Piits out of his district. I’m 110% behind this.